The corporate ladder.......and the music business. Some observations from a professional in the no-collar work force. If you're like me, you play music. You may even be lucky enough to make a living with your music. I became one of those lucky few about a year and a half ago, and not a day goes by that I am not completely grateful for how I pay my bills. Because I am able to make a living...a modest living, but a living nonetheless....I have had the chance to travel to some awesome places, play some awesome shows, spend time with awesome people, and overall just have an awesome time. I have noticed, though, that professional music (ESPECIALLY that which exists in Nashville....) can have some subtle negative effects. One of the draws to professional music for most people...myself included...is that it is an alternative to the white collar world of the desk jockey. The world of a desk jockey, in our eyes, is a world in which colors are duller. The white collar, or corporate, folks are always looking for the NEXT thing...the next promotion, the next raise, the next ____________. Alright. So those are just a few. It is really quite amazing how similar the "corporate ladder" is to the world of Nashville music. Maybe you don't have the "grass is always greener" attitude. But I do. And it's driving me crazy. So if you share this attitude...let's try this. Let's not worry about the guy that "isn't as good as you" who has the big gig. Let's not worry that the guy who "isn't as good as you" got his guitar at cost. Let's just be happy that we get to play music, pay our bills, and eat close to 3 meals a day. There is a lot of talk these days about the direction of country music. A LOT of talk. There's been name calling. There's been tight pants. There's been lip synching. It has all the elements of a middle school talent show. 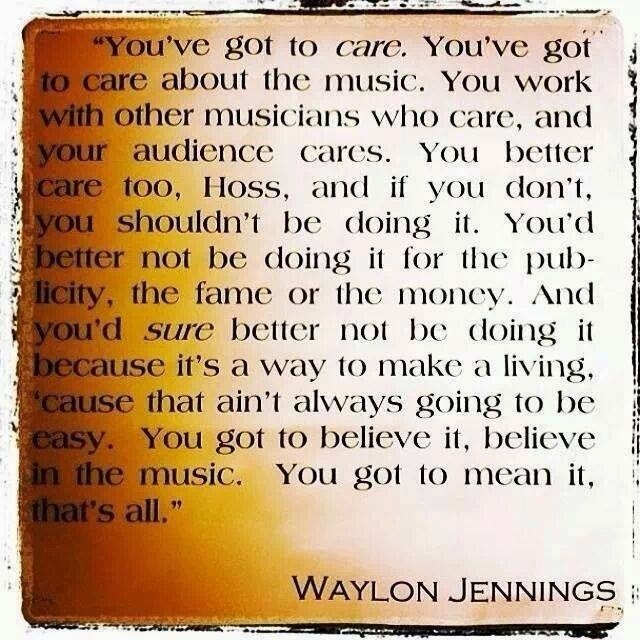 What the country music genre doesn't have, though, is honesty. I don't really care who's fault it is. Blame the record label executives, blame the songwriters, blame the fans. You choose. I have no problem with those people. I have a problem with myself. As a professional in this industry, I have found myself more and more OBSESSED with perfection. Every note has to be perfect, every song has to be perfect, and everything has to be PERFECT. And here's the problem with perfection...as soon as I say something is "perfect" or "imperfect," I'm judging it based on how I think it will be received. So let's start making art again. Just write the song. Just play the notes. Just do what you love. That's what I'm gonna do. Who cares how our art is received. I've always wondered why music from the 1500s is still regarded as the best of all time. We've had over 500 years to improve ourselves...are we not improving because we are not as honest? Finances. Art. Entrepreneurship. They do not go hand in hand. Even if they did, that would be three hand-holds going on and it would still be weird. After my first year as a self-employed musician, I have learned a little about a lot. Here is my greatest lesson so far: I will never be able to control my top line. (For those of you who aren't business savy, "top line" refers to income, cash, dough, benjamins, etc...) While I can certainly take steps to market myself and my skills, there will never be any sort of guaranteed income. No steady paycheck. No amount I can count on from year to year. There will be good years. There will be bad years. I know you need that new Tele. I know you need that new Matchless Amp. But trust me. You need to eat for the next year. Let's not be starving artists anymore. I hope you have learned.